"Rising 272 feet, the distinctive gold dome has become an eternal symbol of our state’s rich heritage. Originally the dome was covered in copper. Since copper was not a native alloy or resilient to the elements, the dome soon became tarnished and many citizens became displeased. The persistent Otto Mears convinced the Colorado Mining Association to donate 200 ounces of 24-karat leaf toward the gold dome project, and soon his dream became a reality. The Board of Capitol Managers spent ,680 for the project and hired the company of F.T. Adam & George Murphy to gild the copper dome in 1908. By 1948 the gold on the dome had begun to wear thin, and reporter Bert Hanna pushed the Colorado citizens to stand behind their symbolic monument. 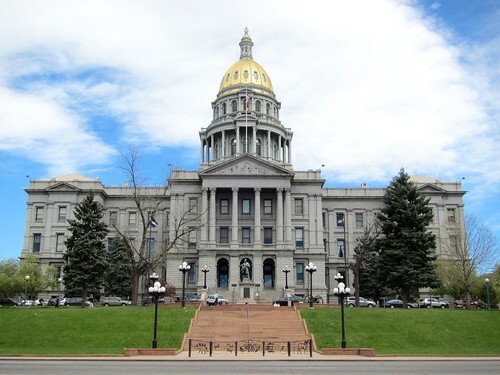 By 1949 the Colorado Mining Association was able to donate the gold needed, and the state paid the ,000 necessary to restore the dome to its previous luster. The dome was also regilded in 1980 and 1991." This entry was posted in Colorado and tagged Capitol, Colorado, State. Bookmark the permalink.